Since returning from California I've been busy! Recovering from my once-a-year cold was not too bad after starting on antibiotics. Next time I take a flight I'm loading myself up with vitamins and some type of immunity booster. 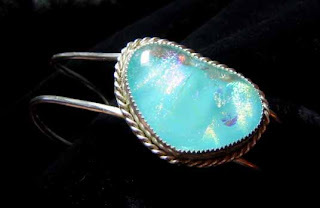 Well, anyway, my busyness consists of, what else, teaching and jewelry making. I'm really enjoying the silver smithing class! I've made four rings and the bracelet that you see above. They are by no means perfect but I always give myself learning room. With the price of silver I can afford to scrap it unless the mistake is really glaring! Maybe in a year or so I'll look at them and not be able to stand them and then scrap it but for now I'm enjoying wearing them. More pictures to come! 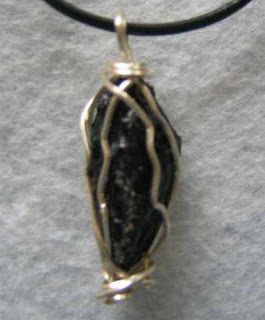 Digging in Ocean View Mines resulted in the beautiful piece of black tourmaline. Since my 4 y/o grandson did some digging along side me that day I made this pendant for him. He still talks about the day he "went inside the mountain"! Wow, how time passes! I feel like May just started and here it's half over! I've been to San Diego and back. I celebrated Mother's Day with my son and his beautiful family. The two pictures above are pieces made by a budding jewelry designer and she's only 8 years old! Emma took immediately to the patterns. She easily followed directions for the Victorian Garden, made for her mom, and then proceeded to make one for herself! 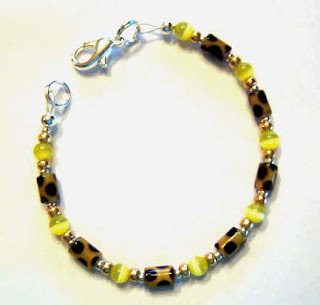 The yellow cat's eye and leopard beaded bracelet is her own design. She made it from start to finish with no help from me! 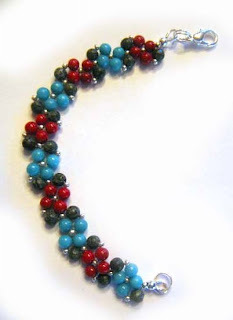 The beads were given to her by my good friend, Linda. She is into all things science and math. Boy am I proud!